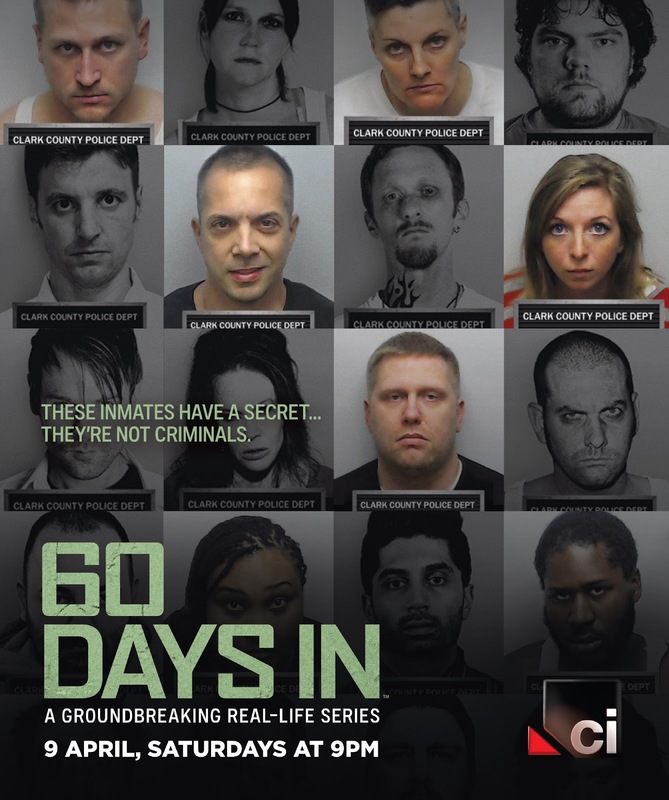 Crime + Investigation Network (CI) presents “60 Days In,” an unprecedented new, original docu-series following seven innocent participants who enter the dangerous world of incarceration at the Clark County Jail in Jeffersonville, Indiana, in an effort to expose internal issues and what really happens behind bars. As a result of the facility’s recent corrupt history, Sheriff Jamey Noel has devised a program where seven participants will live among the facility’s general population for 60 days without officers, fellow inmates, or staff knowing their secret. Around-the-clock cameras captured this unparalleled access in an effort to bring problems to light and give viewers a first-hand look as the participants adapt to unfamiliar and terrifying surroundings. “60 DaysIn” is a warts-and-all view of what life is like behind bars, through the eyes of people who have never been charged with a crime or done time. This twelve-episode series premieres Saturday, April 9 at 9pm (PH) on CI. CI is available on Skycable Ch 98 , Dream Satellite Ch 35, Cablelink Ch 41 and Destiny Cable Ch 98. “We are grateful to Sheriff Jamey Noel and the Clark County Jail for allowing our cameras to capture this unprecedented and trailblazing program. This provocative series will be an incredible addition the to rich non-fiction portfolio as the network continues to bring audiences cutting-edge immersive content,”says Elaine Frontain Bryant, EVP and Head of Programming for A&E Network. “After recently taking office, it was no secret that the Clark County Jail had problems and we needed to take quick control. The only way to truly understand what was going on in the jail was to implement innocent participants into the system to provide first-hand unbiased intelligence. These brave volunteers helped us identify critical issues within our system that undercover officers would not have been able to find. We couldn’t be more thrilled with the success of this inaugural program,”says Sheriff Jamey Noel. Clark County Correctional Jailhouses approximately 500 prisoners, from inmates charged with drug dealing to first time offenders to capital murder. Over 12 episodes, the participants, who were hand selected by Sheriff Jamey Noel, are followed by hundreds of cameras planted throughout the jail exposing their journey. Each participant’s reason for volunteering for this program varies, but they share the ultimate goal of leaving with a better understanding of the system –how it operates,its psychological effects, and wanting a part in exposing its larger impact on society. The sheriff is joined by Captain and Public Information Officer, Scottie Maples who helped provide training to all seven participants prior to being placed into the jail to help prepare them for their experience. Would you be willing to give up your freedom and risk your life to better understand America’s polarizing jail system? The participants in this project have. “60 Days In”is produced by Lucky 8 TV for A&E Network. Executive producers for Lucky 8 TV are Gregory Henry,Kimberly Woodard and Jeff Grogan. Executive producers for A&E Networks are Elaine Frontain Bryant, Shelly Tatro, Drew Tappon and Brad Holcman.